Donal, an Irish lad, and Myron, a Cockney-Jamaican mix, meet aged seventeen as book reviewers and trainee journalists. Before long they're onto the hottest stories in London. While exploring the other planets, we found that they were all inhabited. Now those people are coming to Earth and looking for work. They're also opening ethnic restaurants in central London. 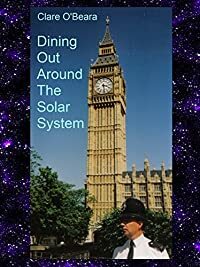 This story is complete in itself and is followed by DINING OUT WITH THE ICE GIANTS and DINING OUT WITH THE GAS GIANTS which are standalone reads within the series Dining Out Around The Solar System.